This letter was written by Walter Guppy Duckett (1841-1909), the son of John Hole (1818-1844) and Ann Guppy (1813-1871) of Skaneateles, Onondaga County, New York. After Walter’s father died in 1844, his mother remarried Edward Duckett (1809-1888) who adopted Walter. Walter enlisted in August 1862 in the 138th New York Infantry. As mentioned in the letter, this regiment was later reassigned as the 9th New York Heavy Artillery and Duckett was placed in Company K. Duckett served on the headquarters staff of Major Taft at Fort Gaines until he was detached as a hospital steward in Washington D. C. with the 2d Battalion at Fort Foote. Duckett was taken prisoner by a Reb wearing a Union uniform on 9 July 1864 between Monocacy Junction and Frederick City on the turnpike. He escaped while on the march southward. His account is captured in the regimental history of the 9th New York Heavy Artillery (p. 307-309). 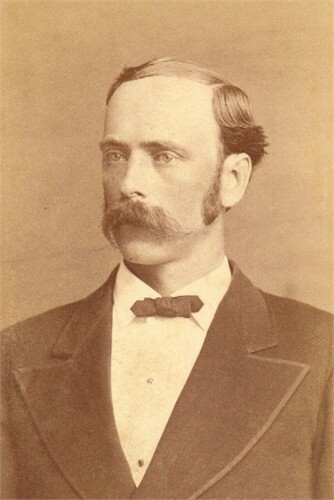 Duckett wrote the letter to his friend, John B. Sayles of Skaneateles, New York, who would later (December 1863) join Co. L of the 9th New York Heavy Artillery and die of pneumonia in March 1864 in a Washington D. C. hospital while recovering from the measles. This evening I will attempt to redeem the promise I made you to write. For the past few weeks we have been busy building “barracks” and quarters, &c. I have now got good quarters (much better than barracks). I have got the tent that Lieut. Col. William H. Sward occupied. It is about 10 feet square and affords ample room for Ben and myself. The “wall tents” are entirely proof against rain. I have been to the city today (Washington). Major [Edward P.] Taft, who had command of this post, started for home this evening on a furlough. I went to the city with him, He has been quite sick with the jaundice. I think a god deal of the Major. He is very lenient to me. He has never yet refused me a favor or a pass. At noon I went up to the Senate Chamber. The President ¹ had just called the Senate to order. They were considering an amendment to a law relating to the Court of Claims ² and as it was not very interesting to me, I did not stay long but went into the Supreme Court which was then in session. I like to hear those able expounders of law argue for their respective clients. There are nine judges elected for life presiding over the court. I was very much struck with their inferior appearance. They reminded me of Catholic Priests with their robes on. I suppose you have heard ‘ere this of our being changed into artillery. It is now a settled fact. We have received our new uniforms. I am much pleased with the change. This carrying knapsacks is not very pleasant though I have been fortunate enough to escape that partly. John, I had to leave this night before last but will now finish it as it is a rainy, dreary day. It commenced raining yesterday morning and has rained most of the time since. This morning when I took the reports to headquarters, I found the mud nearly to my horse’s knees. 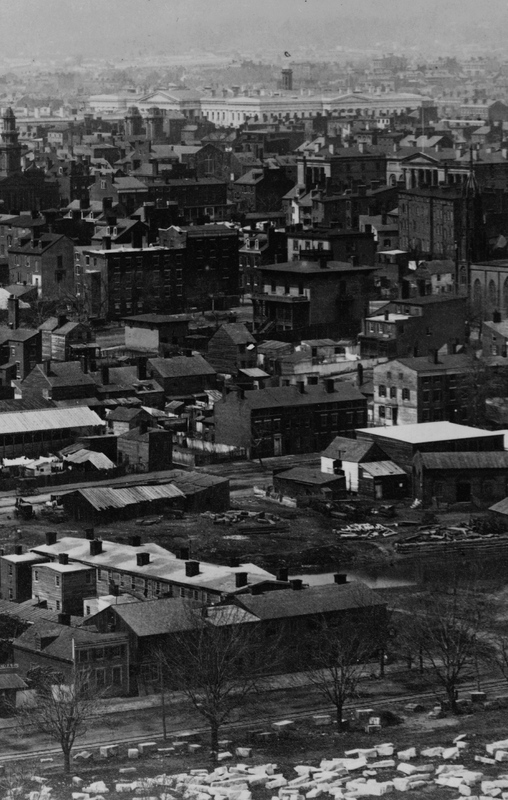 View from Capitol Dome in 1863; Patent Office is large white building at top of image. Well John, I suppose you would like to know what I think of war. I will not say much — only that I am fully convinced that it is a “humbug” or a war of speculation. I find that it is a fine thing for an officer to have plenty of patriotism when at home but when they get down here it is played out. Money and position are the only matters of consideration with them here. The more they can rob their “beloved country” (as they call it) the better they are suited. And if you could but be in the streets of Washington but for one hour, you would be fully convinced of the fact. Pennsylvania Avenue is constantly thronged with officers of all ranks who put up at the largest hotels and live in the best style and all this extravagance is at the expense of their beloved country. The other day I was in the Patent Office and among priceless relicts contained in this the Nation’s casket was the clothes and camp equipment of that immortal hero and patriot Washington — the identical tent he used when enduring the hardships and perils to buy with blood the Union which we are now so weakly trying to perpetuate. Oh!! I could but wish that we might have a second Washington that those clothes might be doubly honored by again fighting the battles of freedom. But enough. If I were with you I could tell you more than I want to write now. P. S. Please give my love to Margaret, Mr. & Mrs. Weeks, and in short to all. Please thank Mrs. Weeks for me for her kindness in send[ing] us that nice cake. It made me think of other times. Now John, I hope to hear from you soon. — W. G. D., Fort Gaines, Washington D. C.
¹ The President of the Senate in January 1863 was Hannibal Hamlin — Lincoln’s Vice President. ² By January 1863, Congress recognized the need to control fraudulent claims against the government. They passed the False Claims Act on March 2, 1863. This entry was posted on Wednesday, July 2nd, 2014 at 4:18 pm	and posted in Uncategorized. You can follow any responses to this entry through the RSS 2.0 feed.